(CNN)-Rosie Rios notices when women are missing in action. The 43rd treasurer of the United States is keenly aware, for example, that on the third floor of the Treasury Department, there is not a single woman among the portraits of the country's ex-treasury secretaries. And in the male-dominated world of finance, female senior executives are few and far between. So after being sworn in as treasurer in 2009, she became fixated on a goal: putting a woman on U.S. currency. Her quiet campaign burst into public view last month when Treasury Secretary Jack Lew announced to national fanfare that a woman of historical significance will be featured on the next $10 note. "When I got to the point where I actually mentioned (my children) Brooke and Joey's name in my remarks, I got choked up," Rios, who turned 50 on Friday, said in a recent interview in Washington. "That's hardly ever happened before in my entire life but it hit me -- it hit me then that this was going to happen." While the new design won't be unveiled until 2020, the announcement is sparking a spirited national debate about which woman should grace the $10 bill. There's also some grumbling about putting a woman on the $10 note rather than the $20, even though the Treasury Department has explained that the decision was largely driven by security considerations. Hillary Clinton, who is trying to make history of her own by becoming the country's first female president, has shared her two cents. "I don't know why they picked the $10 bill," she told CNN's Brianna Keilar earlier this month. "I think a woman should have her own bill and it may be more appropriate to look at the $20 than the $10." Rios shrugged off the debate over why a woman is being placed on the $10 note rather than the $20 and why founding father Alexander Hamilton is being booted rather than former President Andrew Jackson. "I just haven't heard that outside of D.C.," Rios said. "For the most part, I think people are excited that this is happening. This is historical." As treasurer, Rios oversees the U.S. Mint, the Bureau of Engraving and Printing, and Fort Knox. Her signature is featured on all circulating denominations of U.S. paper currency, and she works out of a spacious corner office at the Treasury Department overlooking the White House lawn. But Rios didn't have an elite upbringing. She was one of nine children born to Mexican parents who immigrated to the country in 1958. Her father left shortly after Rios' youngest sibling was born, leaving her mother to raise her children largely on her own. "She's a survivor. She never hesitated in what she was teaching us," Rios said of her mother. "It was the three F's in my family: family, food and faith. And she reinforced that every step of the way." With her mother stressing that education was the ticket to a better life, Rios was a voracious reader as a child and poured herself into her studies. She graduated from Harvard University in 1987 and in the private sector, she worked her way up to a managing director position at a real estate investment firm in San Francisco. 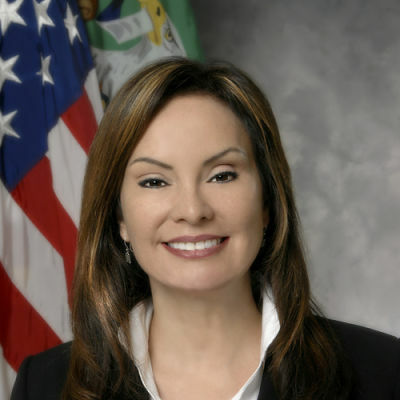 In 2009, President Barack Obama nominated Rios for the treasurer job. Valerie Jarrett, a senior adviser to the President and head of the White House Council on Women and Girls, said Rios' humble upbringing shapes the treasurer's approach to her work. "She comes into this extraordinary, important role never forgetting where she came from," Jarrett said. "She spends a lot of her time thinking about how to encourage women to go into the fields such as finance where they are under-represented and she's a great example of this success story." The unveiling of the new $10 bill design in 2020 will coincide with the 100th anniversary of women getting the right to vote. In an unusual move, the Treasury Department is taking suggestions from the public, encouraging people to submit their ideas through the Treasury website as well as social media using the hashtag #TheNew10. A poll conducted by "Women on 20s," a popular campaign to get a woman on the $20 bill, showed that the leading contenders were Harriet Tubman, Eleanor Roosevelt and Rosa Parks. Rios and other senior administration officials have been careful to avoid singling out any personal favorites. But asked to name a political role model, Rios was quick to name Shirley Chisholm, the first African-American woman elected to Congress. Rios has fought to elevate women in Washington in other ways. She pushed for the first Women in Finance Symposium in 2010, which has since become an annual tradition. And soon after being confirmed treasurer, she lobbied then-Treasury Secretary Tim Geithner to redecorate the walls of the long, marble-floor hallway outside her office. Today, the "Gallery of Women in Treasury" lines those walls — an exhibit that shows snapshots of women's contributions to the U.S. Treasury Department over the centuries. One of those portraits is from 1878, of a woman working on a coin press. Asked how that woman might react to the decision in 2015 to put a woman on the $10 bill, Rios answered: " 'What took us so long?' "